Kelly’s announcement signals rapid and potentially dramatic change for an agency that’s been under heavy scrutiny for the ballooning number of kids in state custody, some of whom have slept in social workers’ offices or bounced around to single-night placements. Kansas has one of the most privatized foster care systems in the country, and it currently delegates foster care and family preservation services to two private contractors. In November, the Department for Children and Families announced that five providers would manage foster care and family preservation under a new grant system. Kelly called the grants “essentially no-bid contracts,” saying in the Thursday press release that she’d asked DCF to delay their implementation. Current DCF secretary Gina Meier-Hummel defended the grants and the process for awarding them, but she said in a subsequent statement that she will pause the grants per Kelly’s request. Laura Howard, director of the Public Management Center at the University of Kansas, will replace Meier-Hummel as the interim head of DCF as well as take over as head of the Department for Aging and Disability Services when the Kelly administration begins later this month. Howard was the regional administrator for substance abuse and mental health services within the U.S. Department of Health and Human Services. She has also led Medicaid, behavioral health and disability programs for the state over more than 15 years at what was then the Department for Social and Rehabilitation Services. SRS was parceled out into DCF and KDADS under former Gov. Sam Brownback. Kelly spokeswoman Ashley All said putting one person temporarily in charge of both agencies doesn’t mean they’re planning to recombine the two, but said the incoming administration hasn’t ruled anything out. 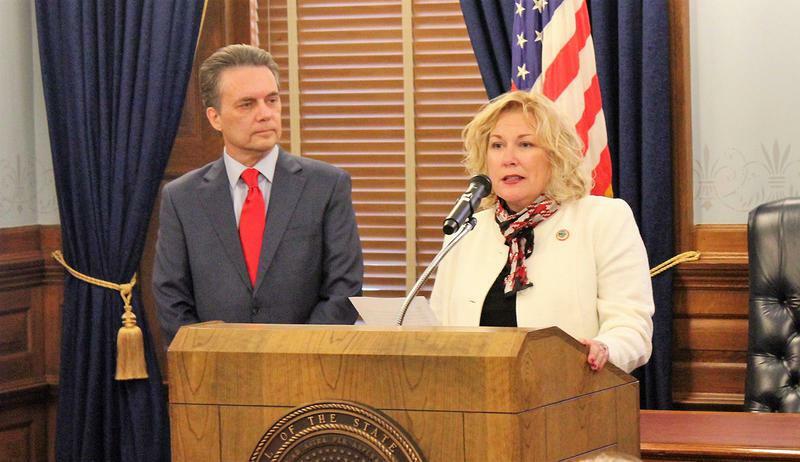 At KDADS, Howard said she’ll be focusing early on mental health services, and on resolving difficulties Kansans are encountering in getting Medicaid waivers that allow people to receive care in their communities, rather than a hospital or group home. She said examining how the child welfare grants were awarded will be a top priority when she takes over DCF. Child welfare advocates have expressed concern that the selection process for those grants was opaque, and that Eckerd Connects, a new provider based in Florida, has a record of some of the same headline-grabbing problems that have plagued Kansas foster care in recent years. Others are worried simply about what upheaval swapping in new providers with the grants might bring and have questioned whether overhauling how the cases of children under the state’s watch are managed makes sense with a new governor coming in. Meanwhile, a federal class-action lawsuit alleging Kansas rendered children in state custody effectively homeless with frequent moves between foster care placements could bring further disruptions. Rep. Jarrod Ousley, a Merriam Democrat who’s introduced several child welfare bills and sat on a task force that examined the foster care system, said he supports the Kelly team’s decision to put the grants on hold. Kelly’s spokeswoman said the incoming governor wants to make sure the grants, as awarded, are legal and in the best interest of Kansas children and families. As the new administration reconsiders how child welfare is managed, Howard said she also plans to dig into DCF’s data on whether parents who had received cash assistance and lost their benefits saw children end up in foster care. Under Secretary Meier-Hummel, DCF has denied any connection. Preliminary results of a KU study linked the higher number of kids in foster care to restrictions under a Brownback law called the HOPE Act that tightened time limits, upped work requirements and placed other expectations on welfare recipients. Doug Besharov of the University of Maryland, who led the team revisiting KU’s research, complained that the authors declined to share their data or models as their study was still ongoing. Besharov concluded the KU study “should not be used as the basis of causal conclusions or policy recommendations,” calling it a work in progress. But he also wrote that his examination of the study’s claims shouldn’t be interpreted to reject any possible link between welfare restrictions and the rising number of kids in foster care. In the evaluation, Besharov raised concerns about whether the KU researchers had adequately factored in increases in the minimum wage, changes to what constituted maltreatment of a child and how much proof was needed to remove children, and changes to who was considered a mandatory reporter of child abuse during the time period examined in their study. Donna Ginther, a KU economist and one of the study’s authors, said her team has made adjustments to include some of those issues already, and that Besharov also raised some valid concerns that they hope to address as the study continues. DCF spokeswoman Taylor Forrest said in an email that the agency’s own internal study of data, outcomes and analysis of welfare policies didn’t find a correlation between welfare policies and an increase of abuse, neglect or foster care placements. Governor-elect Kelly has said reexamining the HOPE Act will be a high priority when she takes over the governor’s office later this month. All, Kelly’s spokeswoman, said the governor-elect thought the KU study raised important issues about Kansas’ child welfare system. “It’s remarkable that the current leadership at the Department for Children and Families thinks it is wise to use $24,000 of TANF funds to pay for this ‘evaluation,’” All said in an email. The use of department resources to rebut criticism of state welfare policies has been a frequent source of frustration for child advocates, like Kansas Action for Children president Annie McKay.